I'm always looking for ways to make learning a foreign language fun. The way I learned languages in high school was not particularly fun, and not terribly effective. 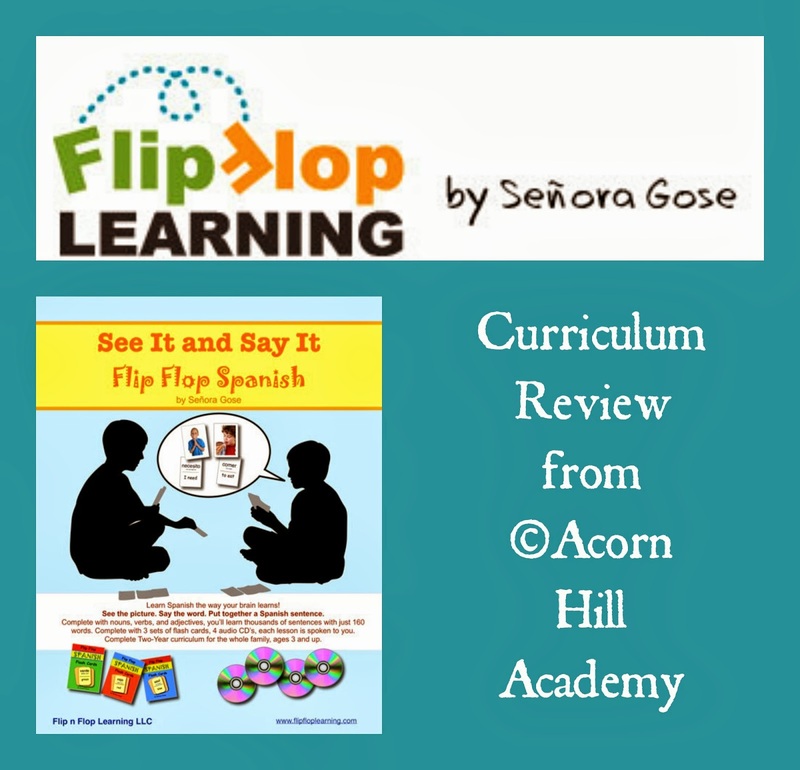 When the opportunity came about to review See It and Say It Flip Flop Spanish from Flip Flop Learning, I was excited to see what it was all about. The program is something you can use your whole family, from preschoolers on up; Señora Gose, the author of the program, says it's for ages 3 to 93. For the purpose of this review, we received the complete physical package, including the curriculum pages, hole punched and ready for a binder; four audio CDs in a binder pocket page; three sets of flash cards; and a white board paddle with a dry-erase marker. The flash card images are of real items, and are nicely done. The program has 45 lessons, and each one is broken down into 3 days of instruction. The lessons are kept nice and short, about 15 minutes per day. You could spend three days per week and complete one lesson, or you could speed it up if you find you and your children are getting the hang of things and want to pick up the pace. This is an easy program to use! On the first two days, you use the cards and CDs to learn and practice vocabulary. On the third day, you, the teacher, read the script in the teacher's manual instead of using the CD, so you get to learn right along with your students. The short lessons are easy to incorporate into morning time, or whenever you're all together. I could even see doing them over lunch time. What I love about this program is kids (and adults) are talking about things that are familiar to them, so it's easy to remember the vocabulary. The first lesson teaches the words for "ice cream," "bowl," "skirt," "dog," "I like" and "I need." The second lesson adds in "spoon," "fork," "plate," and "bird," so you can request everything you need to enjoy a nice bowl of ice cream. By the end of lesson 6, you've learned 26 words, and know that Spanish nouns are either masculine or feminine and how to make them match their articles. It's easy to practice the vocabulary, because the words you learn are part of everyday life - you can point out things like spoons and forks as you set the table, for instance. Señor Egg Head appears throughout the book with grammar notes for teachers/parents. You can decide how much to explain to your children, depending on their readiness. For the most part, I've found that kids pick up on the correct way of saying things without having to explain the nitty gritty details, but older students would certainly benefit from knowing more about how Spanish works. Señora Gose has lots of fun ways to practice your new Spanish vocabulary. As you learn the words, you touch the corresponding picture cards and flip them over, and you see the words on the back. You lay the cards out to make sentences, and at our house, that means lots of silliness is likely to ensue! My competitive children loved the speed drills - how fast can you identify the words and touch the cards? You can play Pictionary with the whiteboard paddle, having each person choose a card without looking at it, and then drawing the word the paddle for others to guess. After lesson 12, there are crossword puzzles introduced for older students. Señora Gose suggests that older students can write down their questions/sentences, but we didn't do that in these first few weeks; my girls have had Spanish before, so we were able to move through the lessons fairly quickly. With 45 weeks of lessons, you could easily complete the program in one year, or spread it out over 2 years with younger children (or whatever schedule works for your family). There are lots of game ideas on the Flip Flop Learning website, for more learning fun. 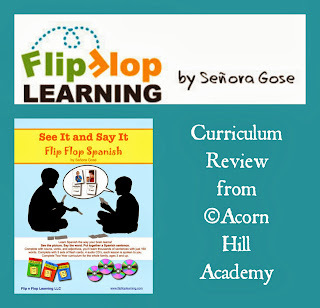 See It and Say It Flip Flop Spanish is available from Flip Flop Learning for $99.95.